America’s 59 national parks and 109 national monuments feature some of the country’s most recognizable landscapes and landmarks. But what of the parks that were quietly decommissioned due to a lack of funding or even vandalism? It’s true—a national park designation isn’t always permanent. We’ve rounded up some of the unusual and forgotten national parks that lost their status. This national monument was created to protect one of the richest deposits of Cycad fossils (fern-like plants) in the world. The designation came too late, however, and by the time the park was established nearly every fossil had been removed from the site by vandals and fossil hunters. The park was decommissioned in 1957 as there was nothing left to see. Mackinac National Park was America’s second national park after Yellowstone, but was decommissioned after just 20 years. 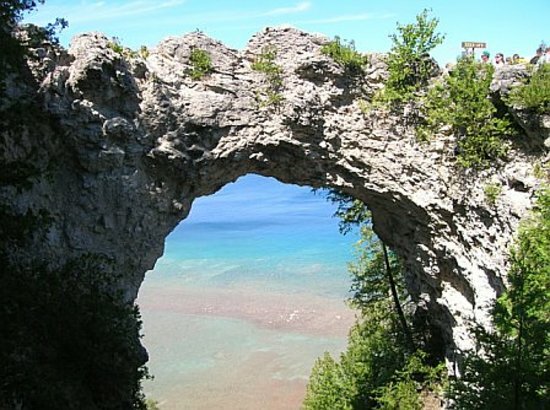 Visitors were drawn to the accessible rock formations like Sugar Loaf and the picturesque Arch Rock—a limestone formation that overlooks Lake Huron. The site was turned over to the state of Michigan in 1895 and became Michigan’s first state park. Platt National Park was at one time busier than Yellowstone or Yosemite. It was the first national park in Oklahoma and the seventh in the United States. The land for the park was sold to the U.S. government by the Chickasaw Nation, which had originally bought the land in what was then Indian Territory. The park contained a number of mineral and fresh springs and the Chickasaw were worried about developers wanting to build resorts on their land. The U.S. government quickly established what would become Platt National Park, which in turn was demoted to Chickasaw National Recreation Area in 1976. This small Confederate fortification and one-time prisoner of war camp was built on an island in the Charleston harbor. It became a national monument in 1933. After the park service decided upkeep of the castle was too expensive, it gave the land back to the Army Corps of Engineers, which sold it to the Sons of Confederate Veterans. It’s now in a state of disrepair and generally inaccessible. This 101-acre plot of land was set side to commemorate the discovery of the area by French-Canadian Pierre Gaultier de Varennes and his son who were likely “the first white men to enter what is now North Dakota,” as a plaque on the site proclaims. Later research suggested he and his son may not have passed that way at all, making the designation pointless. Congress withdrew its designation as a national monument due to its lack of historical significance, and most of the site is now underwater due to a dam nearby. This distinctive Rocky Mountain peak was once an iconic part of the American landscape. The “holy cross” is a cross-shaped snowfield on the north side of the mountain—visible from a great distance. Henry Wadsworth Longfellow wrote a poem about it and artist Thomas Moran immortalized it in a painting. Over the years, however, attendance at the park dropped off and the park service could no longer justify a full staff. It was decommissioned in 1950 and while it’s still a much-photographed peak, it’s been largely forgotten by the American public. This cavern, one of the deepest in the U.S., runs about 2,500 feet down and features interior walls covered in white crystals. Buffalo Bill Cody was a high-profile visitor to the cavern shortly after its discovery. By the 1950s, however, both local and state officials were worried about perceived neglect of the site by the National Park Service. Ownership of the site was turned over to the nearby City of Cody for development as a tourist attraction. Those efforts failed—the entrance to the cavern is now covered by a metal gate and a permit is required to visit. Once America’s smallest national monument, this 320-square-foot plot of land features an 18-foot tall bronze cross. The cross (originally made of wood) was erected by a Jesuit missionary at the site of a garrison whose inhabitants had been struck by disease and starvation. The land has now been incorporated into Fort Niagara State Park. This Arizona park is famous for its red sandstone and giant saguaro cacti from which it takes its name. The park was decommissioned in 1930 and used as a prisoner of war camp during World War II. It was the site of the largest prison break during the war: The Great Papago Escape saw twenty-five POWs flee through a tunnel into the desert. It’s now a municipal park jointly operated by the cities of Tempe and Phoenix. This was the monument nobody wanted. There was considerable opposition among Wyoming locals and legislators to President Roosevelt’s executive order creating the park—anger about what they saw as an overreaching federal government and the loss of a tax base that private lands would have provided. This feeling of mistrust was exacerbated by the revelation that John D. Rockefeller, Jr. had secretly bought up 35,000 acres around Jackson Hole with the intent of donating the land to the National Park Service. Cattle ranchers protested by driving their cattle onto the newly created parkland. It was folded into Grand Teton National Park in 1950—an act which included legislation limiting the powers of presidents to create national monuments in Wyoming.